Authors are always looking for fun (and cheap, and effective) ways to promo our work, and one of the best I’ve found so far is sampler booklets. Prevailing wisdom is, nothing sells your writing like your writing. Think of the farmers’ markets: The samples they put out to entice you aren’t pens and postcards — although those might be available somewhere. They let you try a tasty nibblet of their yummiest snacks. Same with your writing. What goes in a sampler booklet? There are a lot of online printers who will make lovely booklets, but they are often expensive. You can sometimes get a better deal buying from a local printer and picking up the booklets rather than having them shipped. Also, I always think it’s a good idea to support your local businesses when you can. Since I have the tools, the know-how, and prefer to print in small batches so I can update my booklets, I print and assemble my own. What do sampler booklets look like? Also the smaller size means I get two booklets per 8 1/2 x 11 sheet of paper, which also means I get two covers. Since I run my covers in color, and color is the biggest expense, I like to keep that cost down. I have an older model black and white laser printer and I refill the toner cartridge myself, so it is relatively cheap to run. My solid-ink color printer is more expensive, but color has come down a lot, so it’s not too bad. I use cheap 20 lb. paper (not the absolute cheapest; I get the nicer Hammermill rather than the dingy-looking office outlet brand) because when you are flying to a convention, those booklets start to weigh down your luggage super quick! A couple hundred booklets can weigh 20-25 pounds. Along with your giveaway books, bookmarks, and Romance Trading Cards, you can easily fill your luggage over the 50-lb. limit, at which point you’re hit with overweight luggage fees and the baggage handlers curse your name. You’ll need access to a paper cutter that can handle the six pages stacked (which creates the 12-page booklet). And you’ll also need a stapler that can reach to the center of the booklet, which means the “mouth” of the stapler must be deeper than 4 1/4″. My PaperPro stapler is just long enough and has a strong one-touch action that makes assembly less onerous. All together, materials cost me about 30 cents for each booklet. Labor is a drag, but I can print, fold and assemble a couple hundred in a couple hours. As long as the music is rockin’ 😉 of course. I wanted to keep the booklets as inexpensive as possible so I can feel good about handing them out by the hundreds. I use Microsoft Publisher to lay out the text pages of the booklets because my version of Microsoft Word doesn’t have a ready-made 5 1/2 x 4 1/4 template. The .pub template was a PITA to set up. Now that it’s done, I just use the same template every time and force the excerpts to fit, fiddling with font size and image size until all the pages are filled. Note: You won’t be able to preview the document in Google Docs because Microsoft Publisher doesn’t play nice with pretty much anybody. But you should be able to download the files without viewing them and open them on your computer, assuming you have the MS Publisher program. Start by replacing my text with yours. Click in the first text box on page 1 of the template, Control A to select all and delete. Then copy and paste your content; it’ll autopopulate to all the later text boxes. If you click in any of the text boxes, little gray boxes appear at the top and bottom of the box (just the bottom or just the top if it is the very first or last text box of the template) which allow you to follow the jumps to previous and subsequent text boxes. The only funky thing about this template is that on text boxes with images (pages 1,10 and 11) I added a small margin on the left side so the text doesn’t run up against the image. You can get rid of that if you aren’t using images. I play with the font size, line spacing, etc. to get the excerpt to fit. My old printer doesn’t duplex print, so I print only the even pages first and then print the odd pages. The way my printer pulls the pages through, that causes the pages to end up in the right order so all I have to do is grab them off the tray and fold. Your printer might pull pages in a different way depending on whether you use the main paper tray or the bypass tray, but it’s worth figuring it out so that you aren’t forced to collate by hand which gets confusing. If you want to get fancier, you could add page numbers, or put your name and the title at the top of each page, or add pull quotes or more photos. In the end, really, my only goal is to put my words in front of readers’ eyeballs. This is the best (cutest, cheapest, etc.) way I’ve found to do that. Hope this helps someone. It would justify all the time I spent formatting the @(*&%(*@^ thing! that said, I downloaded Google drive and still can’t get your files to open. Do you have Publisher? Which version? I’ll see if I can get a version from Publisher to Open Office and still keep all the functionality. Jessa is awesome! Thanks for sharing your template and knowledge. Such a time saver! Your how-to article is very helpful! I’m going to try booklets for my new releases. Thank you! This was great. I already have the chapter ready to go. Quick question. Where do you go to print your covers, and on what stock paper? Since I have access to an inexpensive color printer (11 cents per page, and since I get 2 covers per page for my 5 1/2 x 4 1/4 booklets, that’s 6 cents per booklet for color covers) I print my own covers. I use a slightly heavier stock (60 lb cover). That does add to the weight, so I tried using a 32 lb gloss, but I felt that was pretty wimpy, especially since my booklets have a decent number of pages, so I went back to the 60 lb. Hope that helps. Thanks, yes it does. Again, I am so appreciative that I found this. 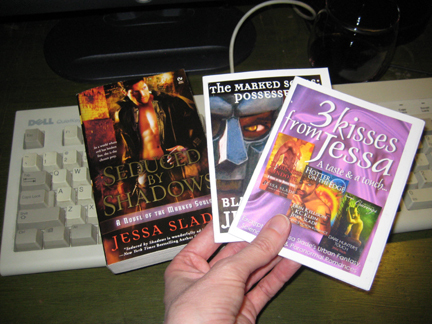 Thanks so much for sharing, Jessa! I know this is an older post, but girlfriend, thank you. Get semi-regular updates, new release info and random giveaway goodness.